My little Peter Rabbit fan enjoys the classic tales and the new animated adventures; Holly is always a little wary of Mr. Fox when she watches Peter Rabbit on the television but she has thoroughly enjoyed the latest installment of Peter Rabbit's adventures which is out now on DVD - The Tale of The Great Breakout. One of the things that Holly enjoys about Peter Rabbit is the recognisable characters and storylines - in the first episode on the DVD Peter has to save a group of squirrel Nutkin's friends from Mr. McGregor and this really brings back memories of the original tale of Peter Rabbit; Peter has to help the squirrels escape from Mr. McGregor's garden with the help of his friends. Holly enjoys seeing Benjamin Bunny and Lily the rabbit too as the three of them normally get into scrapes together! The DVD from Abbey Home Media features over 70 minutes of Peter Rabbit adventures and also comes with a free height chart which Holly thought was excellent fun (she feels better knowing that her big sister is taller than Mr. Fox). Since watching this DVD, Holly has shown a particular interest in eating radishes...I wonder why?! 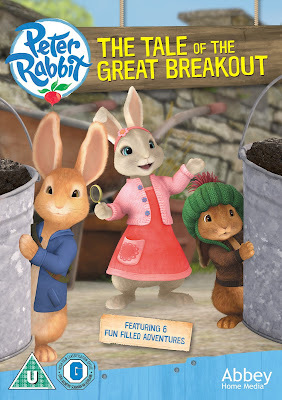 We've enjoyed watching Peter Rabbit and his friends in The Tale of the Great Breakout and I expect this DVD to join us on a few of our holiday travels this summer too.